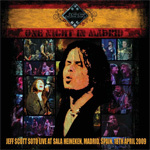 For Jeff Scott Soto fans, I don't think it gets any better than this: One Night in Madrid is terrific. Recorded in April 2009 during his extensive and vigorous Beautiful Mess tour, the show continues songs from that album plus others spanning his solo career (which means, thankfully, no Journey songs). Above anything else, this live set proves once more JSS as one of the best rock singers of our time. The chosen material also shows the depth of Soto's vocal versatility being able to deliver masterful melodic rock, funk, soul, and blues vocals, sometimes balled up in a single delivery as on 21st Century or I'll Be Waiting. The show and its performers are energetic and tight; Soto engages the audience throughout, and they respond with fond enthusiasm. Though he doesn't revisit his Journey years, JSS panders to the crowd with Stand Up from the Rock Star movie. Yet, the most memorable, and fun, parts may be the encore medley filled with pop, rock, and funk numbers like We Will Rock You, Brickhouse, and the hilarious Kung Fu Fighting and Stayin Alive. (This is even better on the DVD as the crowd reaction shows perplexed amazement.) Jeff Scott Soto is a class act, and One Night in Madrid is a dead on entertaining delight. Quite recommended! On the DVD side of One Night in Madrid, the show is blessed by a small venue which creates an intimate, hot, and sweaty atmosphere for band and crowd. The production is better than expected with a clear mix of instruments, with Soto getting the emphasis. JSS is engaging and articulate in voice and mannerisms as he brings each song to life. I could easily pass on the goofy, even amatuerish, video effects that appear at the start, but otherwise the camera work and direction gets you on stage and into the action. Additional highlights include some JSS music videos and out-takes. Overall, it's a solid effort and representation of JSS and band in great form. Jeff Scott Soto is a class act, and One Night in Madrid is a dead on entertaining delight.